DHADING, Nov 7: Bhawani Karki, 21, did not have a sound health when she was born. Things did not improve even later. When she turned a toddler, she would fall when if she attempted to walk. She grew up with low self esteem and unfulfilled dreams, she says. "My dream was to become independent. And that day was hard to come by," she reminisces. "My hands and legs were fragile compared to others and I always thought that I would remain a burden for my family for lifetime." Last year, Karki heard about a tailoring training program mean for women like her. She wondered whether she could join and whether her 'weak' hands and legs would support her to fulfill this aspiration. A local of Palangkharka village of Galchhi Rural Municipality, she dug further about the information and when she came to know about the details she got some encouragement. "When you are born with a poor health, you become a subject of irony. Your own friends and relatives laugh at you. I have bitter experiences of people making fun of me," Karki said while going down the memory lane. "Actually, normal people do not realize how disabled one like us feel, when they mock at us." When it was time for her to join school, her family gave her crutches. That enabled her to go to school. Till fifth grade, the crutches helped her go to school which was nearby her house. Then her studies came to a halt. "Secondary school was far away. Children would walk for hours to go to school. I did not study after primary level as it was very far from my home," said Karki. "The day I stopped going to school was the day I stopped dreaming big." Later, she was given a wheel chair. However, going to school far away was still not possible. 'Life felt like a burden,' she shared. Dhading branch of Apanga Sangh Kalyan Nepal last year invited women like her to join training of tailoring. She joined the sessions. Within a few months, Karki was able to design and sew women's dresses. In a year, she became a professional tailor. "Life then changed for me dramatically. What I had never imaged of happened. Independence came through income and I think that is the major thing which determines your independence," an elated Karki now says. In the beginning, she had trouble in learning the skill. There came a time when she even felt like giving up. But trainers encouraged her to continue. "Since my hands and legs were not very functional, I was really upset. While making dresses, you cannot have an excuse; your costumers want it perfect. So, a fear deep inside questioned me if the profession was for me at all,” said Karki. She added the practice she did during the training made it easy for her to understand the intricacies of the job. Now she takes order for sewing Kurta Surwal, tops, frock and children's school dress, among others and this has been fetching good monthly income. "I do not have to worry about money nowadays. If I work hard, I can earn well for my family," Karki said confidently. Pramila Shrepa, 24, is no less happy with the tailoring training. This free training has changed her life too, says the local of Taplejung. "I came to Dhading just to learn this. I am very happy that I made a good choice," she said. Just like Karki, Sherpa also suffers from muscle related problem. She had heard about the training in a radio. She took no time in packing her bag and landing in Dhading for the training. "It was for free. So, I did not like to miss it. I was going to learn something very useful and that too at free of cost," she said. Shrepa added that such trainings are not available for people like her. Or else, it would be even easier for her. After a year-long training, Sherpa is a professional tailor, too. "I make women's clothing. I sew, repair, and sew modified clothes. I also make children's clothes. It's a good job," she said. Sherpa also feels great about being free from economic dependency on her family members. Had she not learnt the skill, life would still be in 'a chain', she noted. After gaining considerable experience, Sherpa plans to expand tailoring to her village. Disabled women like her would be in her priority list as she wants to train them. "It is important for everyone to become economically independent. But it is more crucial to be so for women like us. We are more vulnerable," she said. "I want to train women once I go back to village, especially women like me who are physically challenged." Apanga Sangh Kalyan has been supported by a few NGOs for the campaign. Disabled women are encouraged to enroll for the training. For women from other districts, the training providers provided free accommodations for the training period. 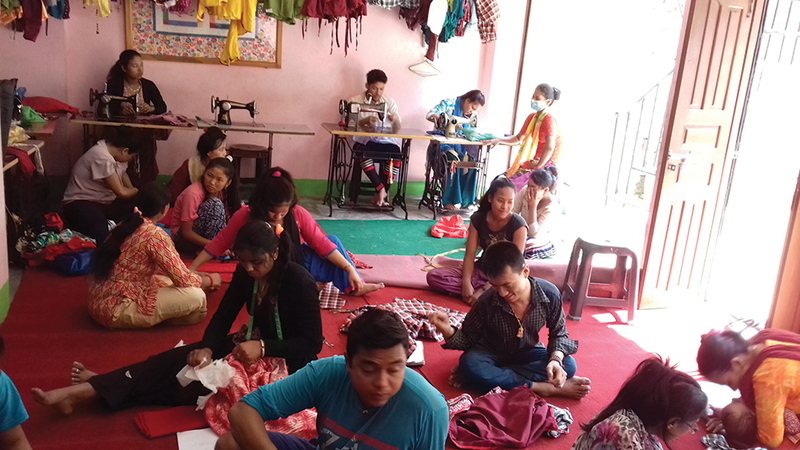 Vocational training on tailoring for physically challenged women in Dhading has been helping the trainees to earn a living and gain independence from their family members.